Today, I want to bring up an interesting quirk about shoreline certifications – the impact of ancient fishponds and other artificial structures on certifying where a “shoreline” should be. Remember, shorelines are “certified” for County setback purposes; they do not determine ownership. They serve as points of reference in determining where improvements may be placed on coastal property. When the State surveyor is satisfied with the location of the shoreline, after reviewing the public comments, the maps and photos prepared by the private surveyor and site inspection, he forwards the shoreline maps to the Chairperson of DLNR, for final review and approval. When I was Chair at DLNR, I signed each of the maps and certified the shorelines. State law (HRS §205A-42(a)) provides that where legally constructed artificial structures are involved, the shoreline is certified not at the upper reaches of the wash of the waves, but, instead at the “interface between the shoreline and the structure,” i.e., at the seaward edge of the artificial structure. “Artificial structures” include such things as seawalls, piers, boat ramps, groins, revetments and harbor facilities. When such structures are placed on state lands with the State’s permission and consent, but are for private use, the State charges the private user for the use of state lands. Thus, even though the certified shoreline may be makai of the artificial structure, the State’s property boundary, as acknowledged by the State and the private user, is somewhere mauka of the certified shoreline. On the other end of the spectrum, the lands makai of the upper reaches of the wash of the waves are not always the property of the State. Some coastal fishponds, although on submerged lands makai of the upper reaches of the wash of the waves, are privately owned. Nevertheless, the certified shoreline is at the natural shore and not the artificial wall of the fishpond. That is because the existence of a coastal fishpond does not alter the rationale for not allowing developments too close to the coast. In these cases, therefore, the certified shoreline is mauka of the property boundary line. To illustrate this, I am using a Google Earth image of the coastal area from our old neighborhood on Kaneohe Bay, where I grew up as a kid. The parcel boundaries are shown; note the boundary line (blue arrow) of the parcels goes out to the end of the seawall of the old fishpond. 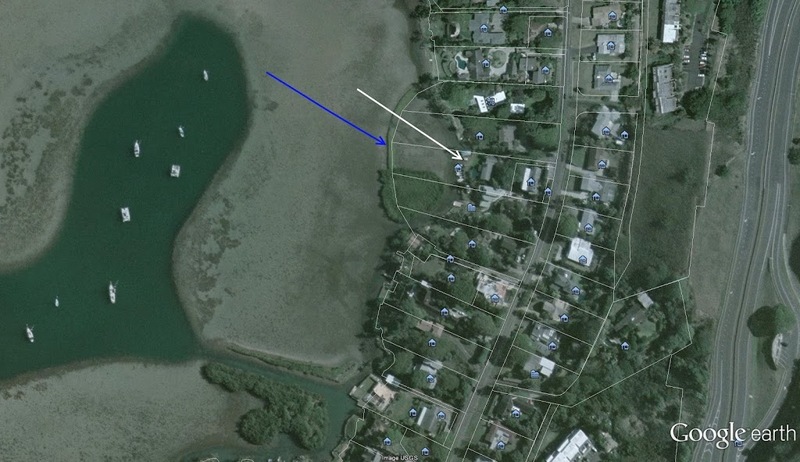 The “shoreline” in this case, would be along the coast (white arrow,) rather than at the fishpond wall.